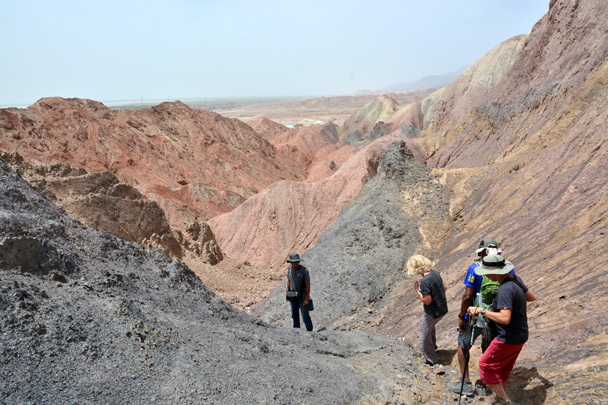 In Brief: A special report from our June 2016 Silk Road trip, with photos and commentary from hiking guide Abu, who is from Kashgar. 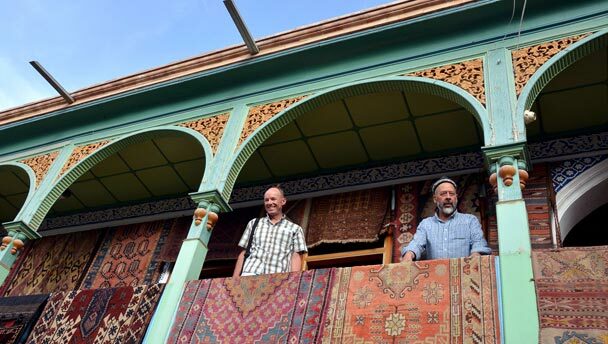 Shopping for carpets in Kashgar. His report takes the form of a trip diary, with text and photos from each day grouped together. Our journey began with the flight to Korla. 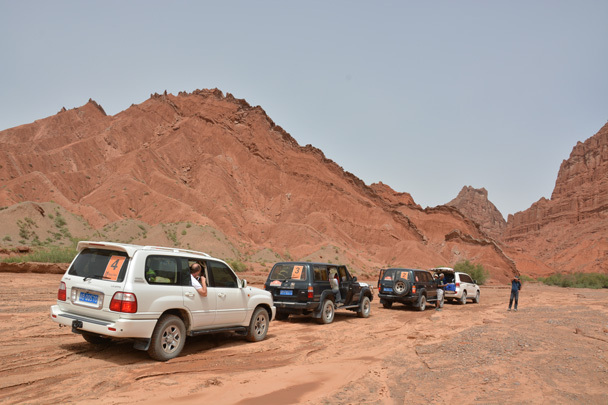 On arrival in Korla we met our jeep team, and headed straight to the first stop on the itinerary – Iron Gate Pass (Tiemenguan). 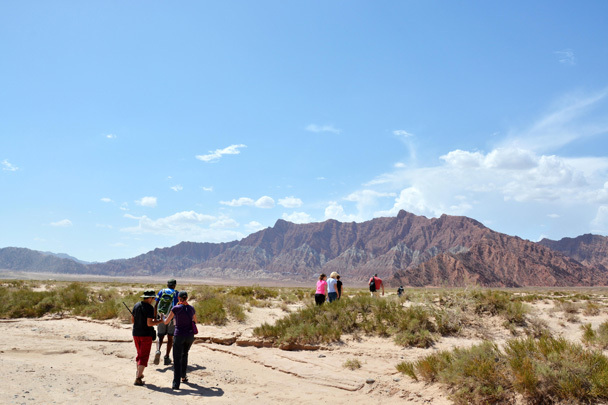 Iron Gate Pass was the main way from Northern Xinjiang through to Southern Xinjiang on the ancient Silk Road. 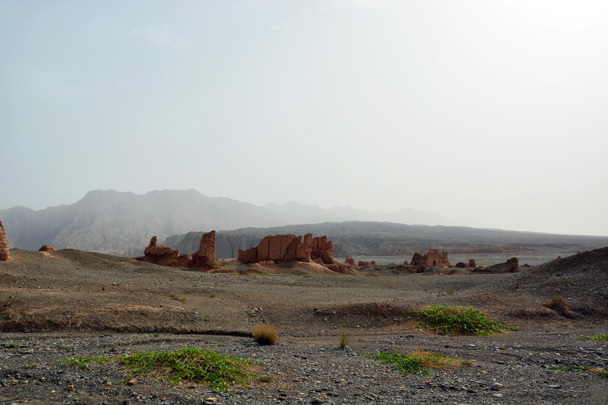 According to Uyghur folklore, real characters of a famous love story among local people once lived here. 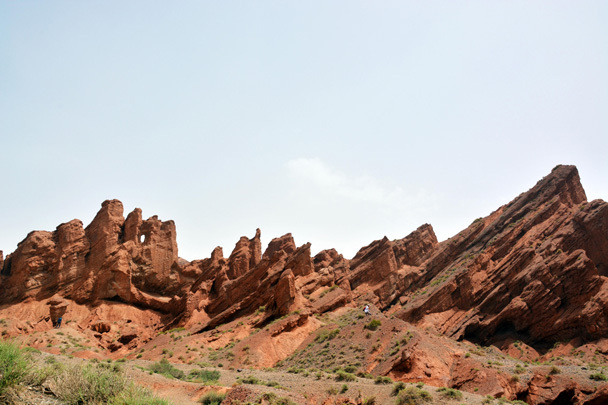 We took an hour to explore, and then headed back to Korla city to visit a traditional style bazaar, a very interesting place to visit on our first day in Xinjiang. 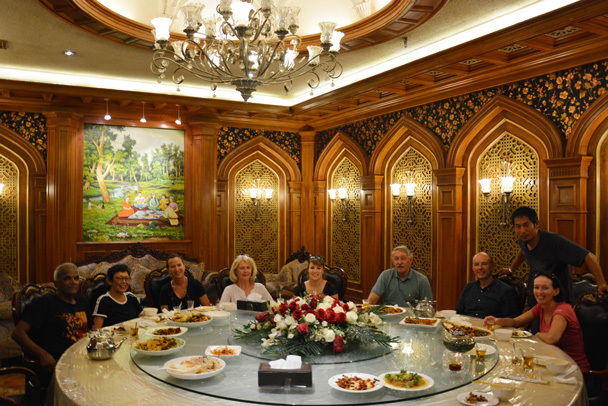 After our visit to the bazaar we had a giant dinner, which was needed after a long day travelling about. Our first formal dinner after a long flight from Beijing to Korla. Nice decoration and every dish seems double size. 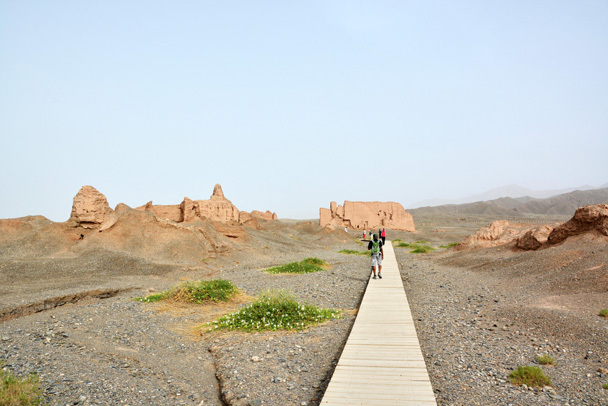 We set out for Kuqa, the next stop for us on the Silk Road. 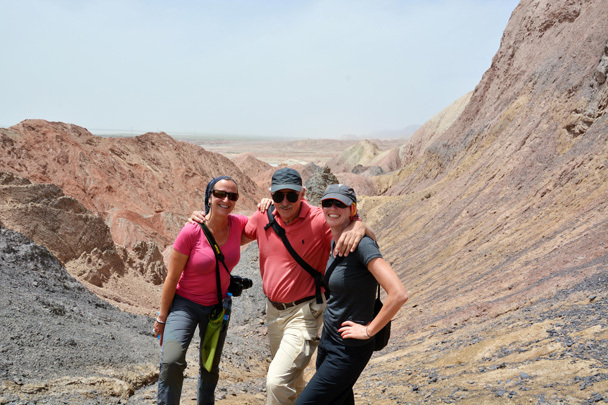 On the way we stopped for a hike in the Yardang landform area. It was a hot day, but we were rewarded with beautiful blue skies and delicious sweet watermelon prepared for us by our drivers. 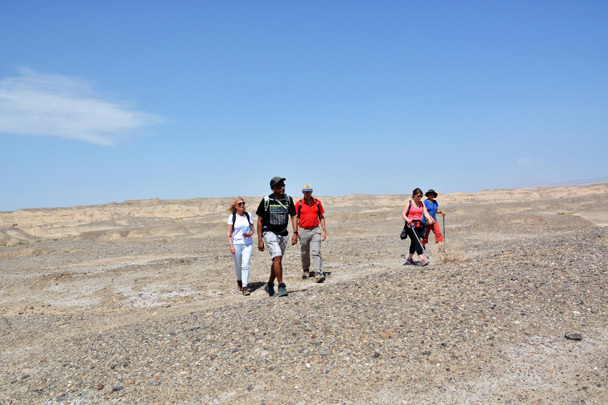 At Kuqa we visited the King’s Palace and the Grand Mosque. The last king of Kuqa passed away in 2014. Even though we were not able to see the king, we learned a lot of the history of the Kuqa kingdom at the King’s Palace museum. 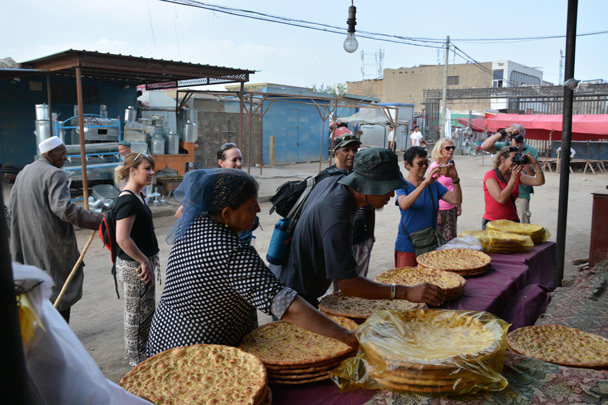 We also visited a riverside bazaar in the old quarter of Kuqa, finding it full of people who were stocking up on food for Ramadan. 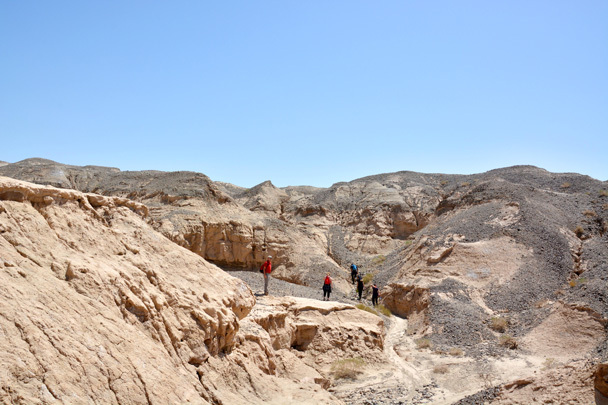 Hiking off to explore some unique landscapes on the way to Kuqa. 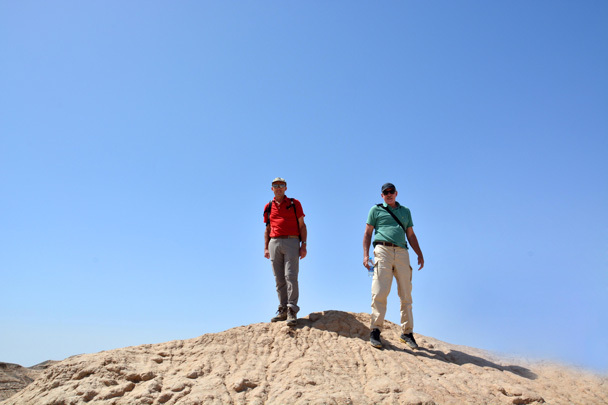 Two gentlemen have claimed the high ground. 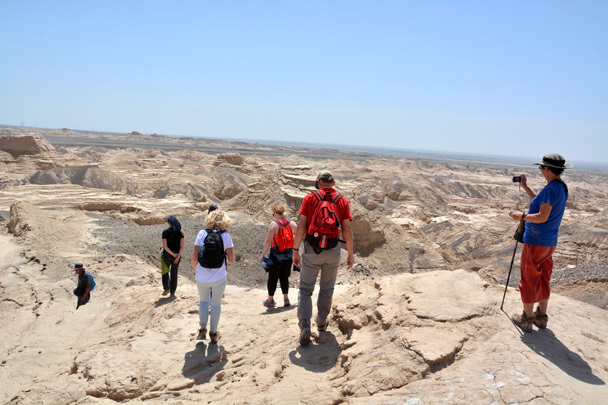 Hiking further into the landform. Up on top for photos. 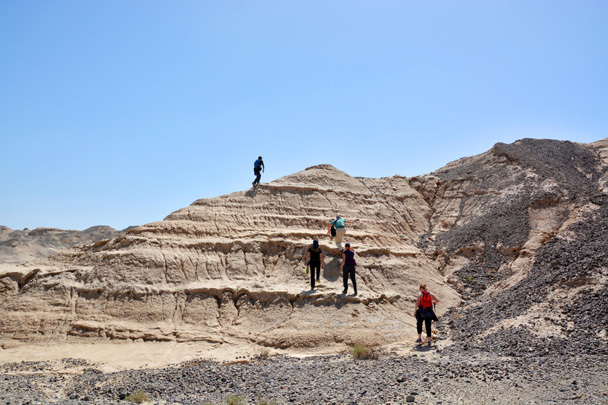 We went deep into the Yardang landscape. 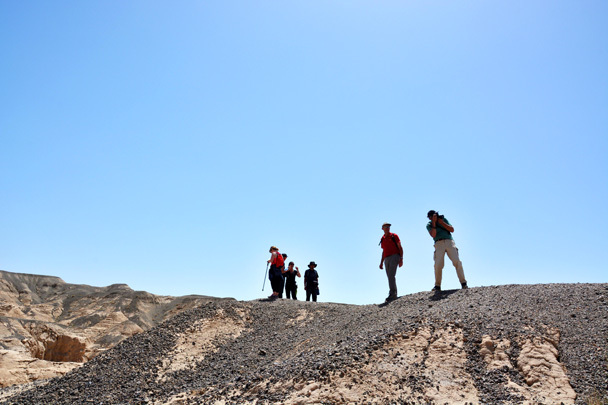 Hiking in the Yardang landscape area on the way to Kuqa. 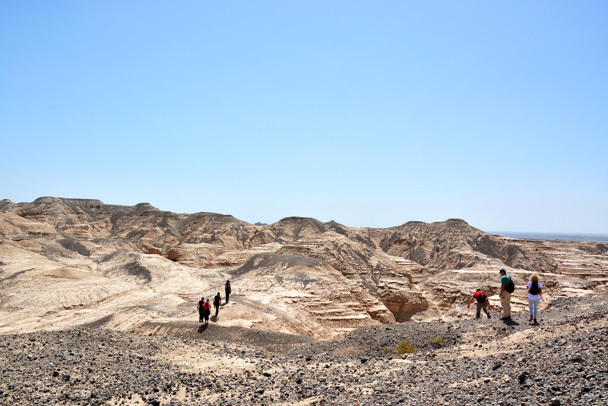 Seems we are the only creatures in this area – so empty. 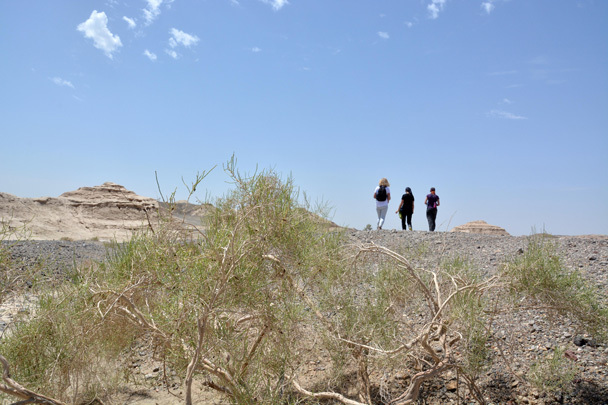 Shrubs are the only sign of life that indicates the area on Earth. Team photo in the wilderness. Our jeeps were hiding somewhere behind those hills. Back at the jeeps and welcomed with watermelon, the best option after a hot day's hike. Watermelon seems more tasty in the wilderness. We are preparing to visit the prayer hall of the Grand Mosque in Kuqa. Taking off shoes is required before entry. 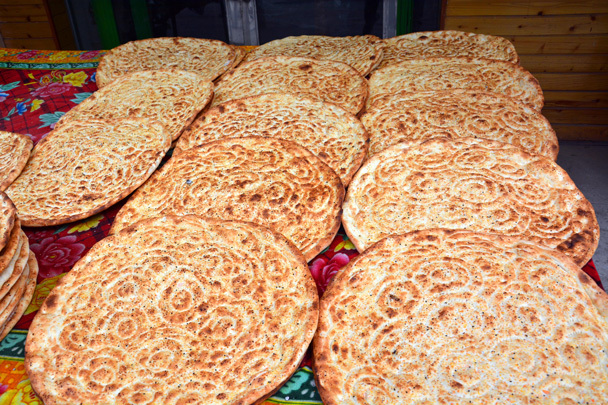 Super big naan bread (AKA ‘hemek’) in Kuqa. The naan bread we bought here lasted until the end of the trip. The baker is showing off his skills. A hundred-year-old house in the city of Kuqa. 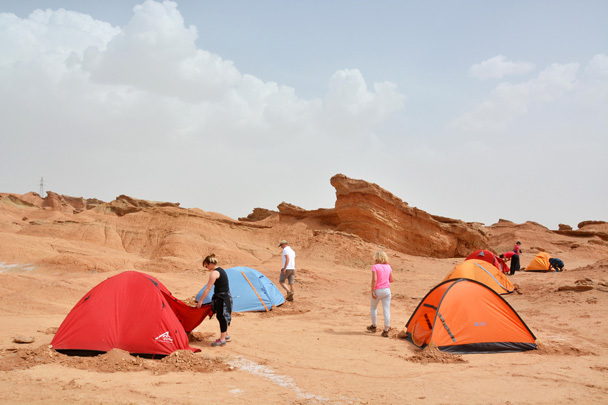 After visiting the canyon we drove to our campsite, set up our tents, and then headed off to explore on foot. We spent most of the day out in the wilderness. 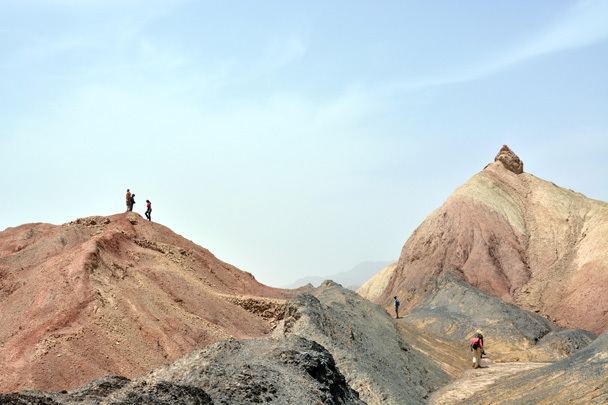 The mountains in the area had so many different colours and shapes we felt we could be exploring Mars. A wooden path leads towards to the remains of the temple at Subashi. Full view of Subashi’s ruined city, including the other half in the distance across the river. 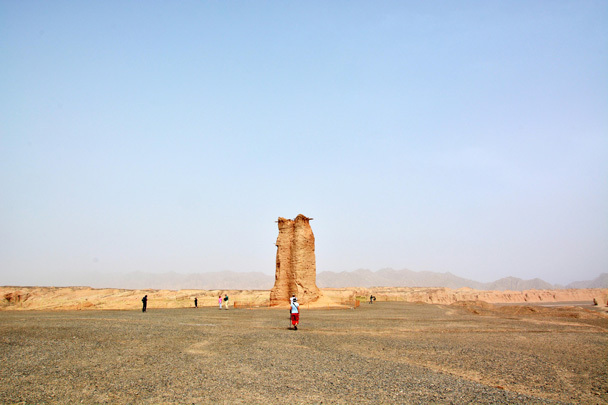 A Han Dynasty-era (206 BC-220 AD) tower stands almost 11 meters tall. 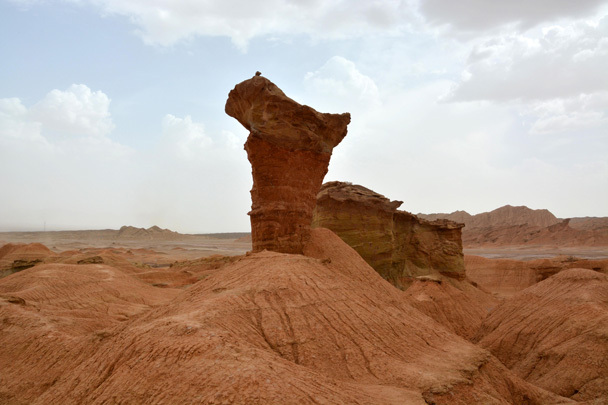 It was made solely of mud and wood – well-built, to have lasted 2,000 years. 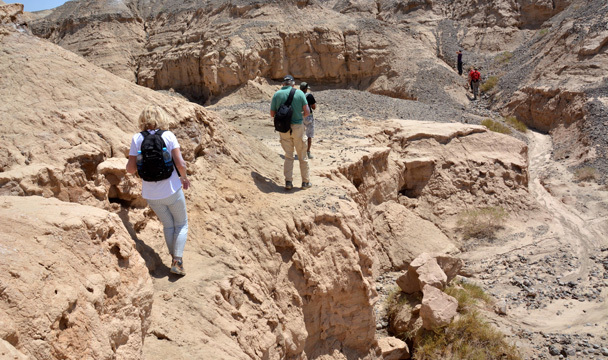 As we are tough hikers, we prefer to walk into the Dakizilya Grand Canyon, rather than driving in. 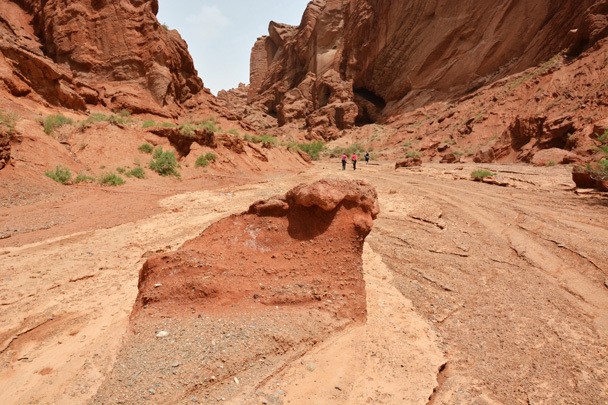 Further into Dakizilya Grand Canyon. 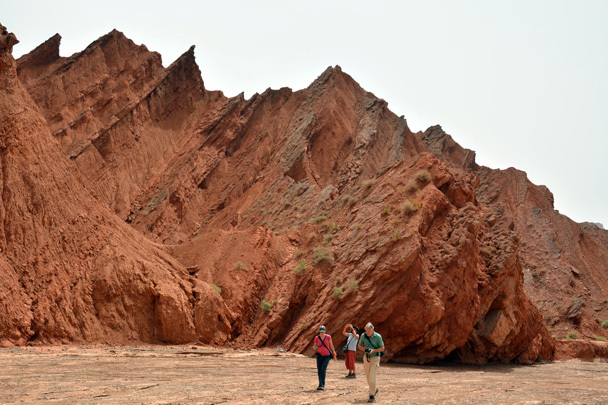 ‘Kizilya’ means ‘red cliff’ in the local language. 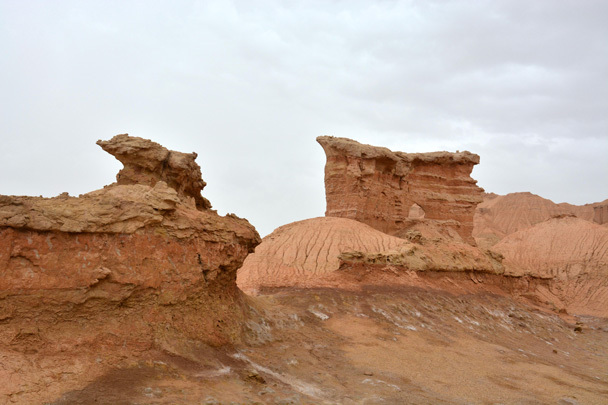 Strange shaped rocks and caves in the cliffs make the canyon more fascinating. 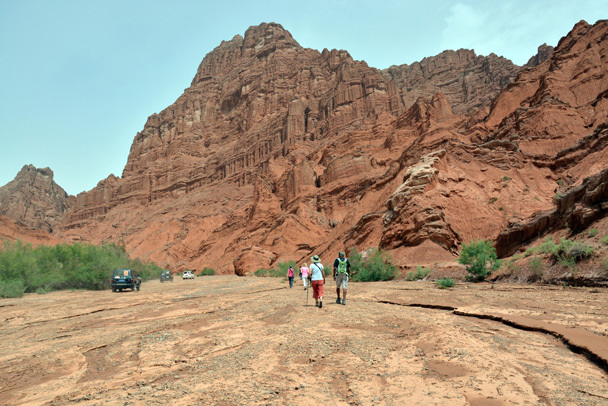 Finished our walk at the Dakizilya Grand Canyon and ready to drive on. A helping hand up, and it looks like the weather is changing. From our campsite this mountain looked like a huge castle. 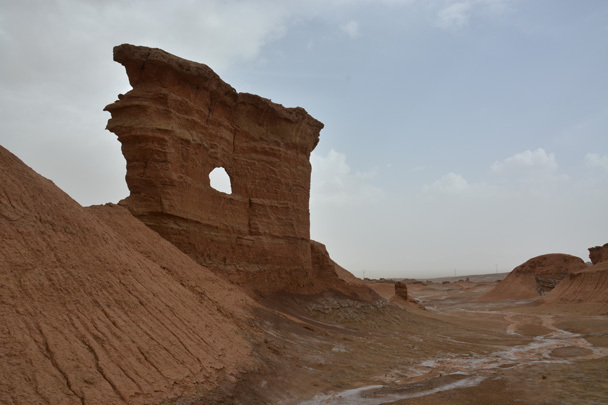 This cliff with a window looks like the remains of some ancient building, but it is all natural. Another shot of the cliff with a window. 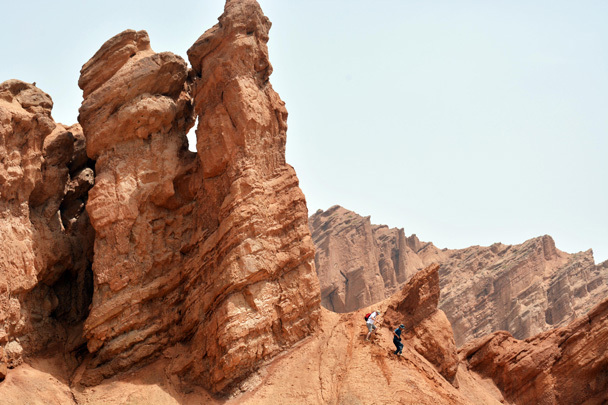 Yanjing and another tough hiker climbed up for a look at this crag. 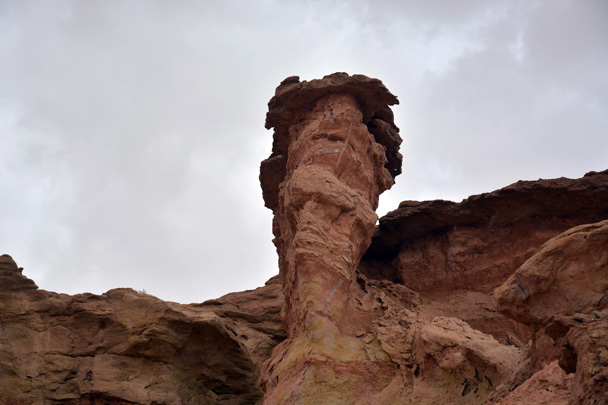 A mushroom-shaped pinnacle formed by the erosion of constant wind. 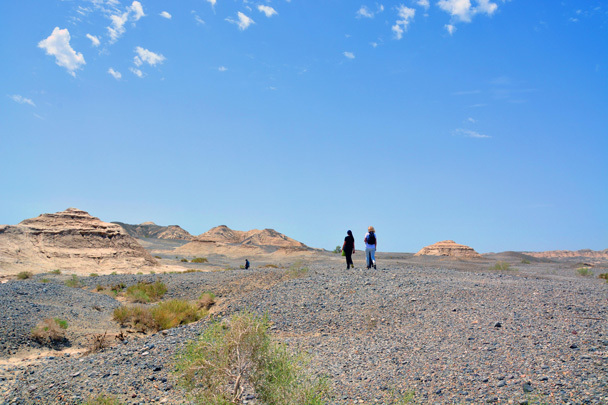 Yardang landscape by our camp site. Another mushroom-shaped pinnacle. We thought we could see the face of a sad old man in it. From a distance, the whole area looks like a unique city filled by different buildings. Heading down to the valley to get back to our camp site. We could have been on Mars right here. 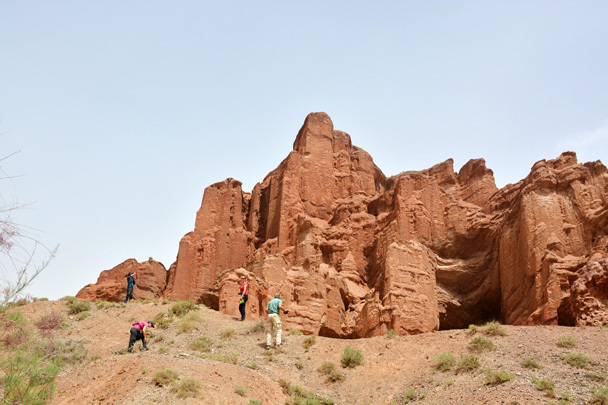 We got an early start and drove to the Kizil Thousand-Buddha Caves in Baicheng County, on the outskirts of Aksu. The caves are found in a cliff above a river, and they’re so serious about conserving the artwork that cameras are not allowed. So we only took memories, no photos. 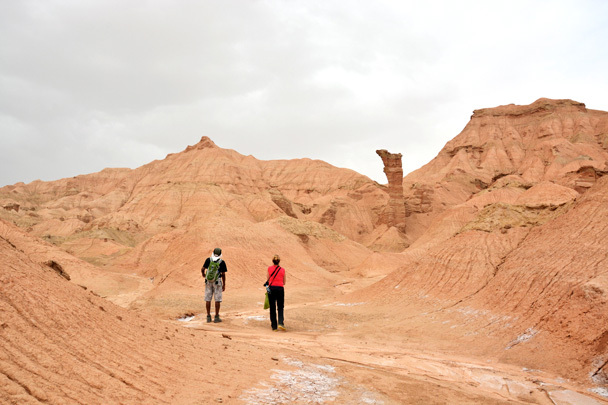 After visiting the caves we drove on towards Aksu, stopping for a short hike on the way. It was early evening when we arrived in Aksu. We checked into our hotel, had dinner, and then went for a stroll in the city. It was cool at night compared to the heat of the day, and we enjoyed a pleasant walk. Heading towards the mountain in the distance. It looks very near, but actually not at all! 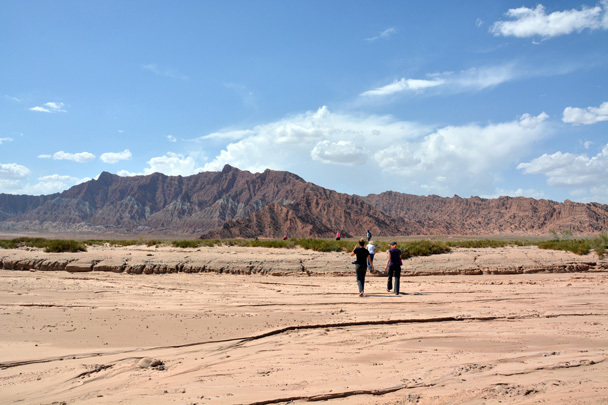 Crossing the dried river by the road that leads to Aksu City. Blue sky over the wilderness. 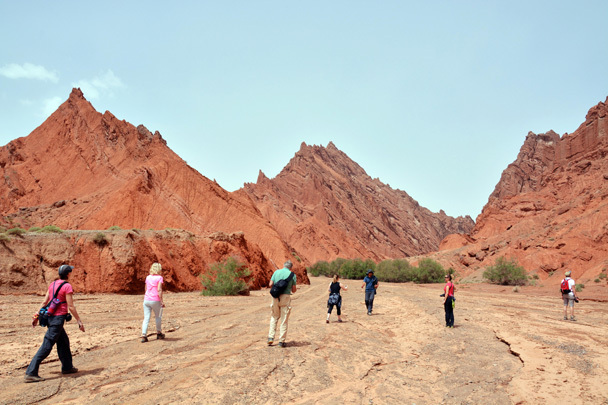 Exploring more in the mountains near a town called Shiker Kol, which means sugar lake in Uyghur. 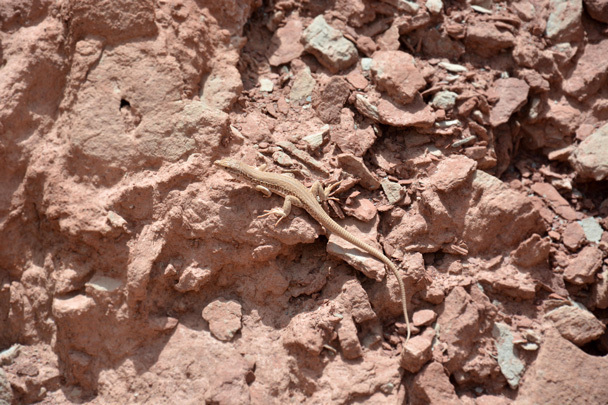 Lizard with long tail in hiding. 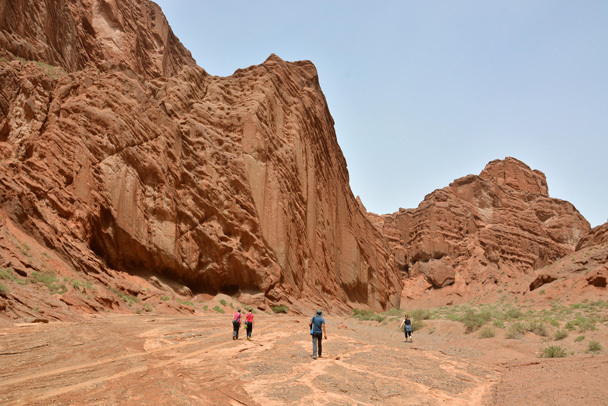 Walking the dried riverbed to find the way out. 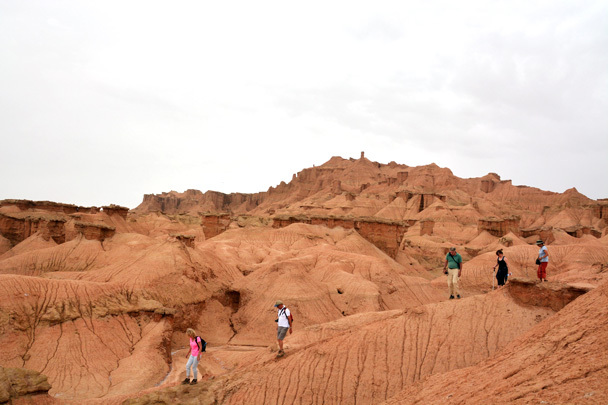 From Aksu we continued on our way to Kashgar. It is a long drive, and we’d packed gear for a picnic lunch. The problem was that there was no shade anywhere for our picnic, and the only place we could find was under a bridge on the highway. Not your usual location for a picnic. 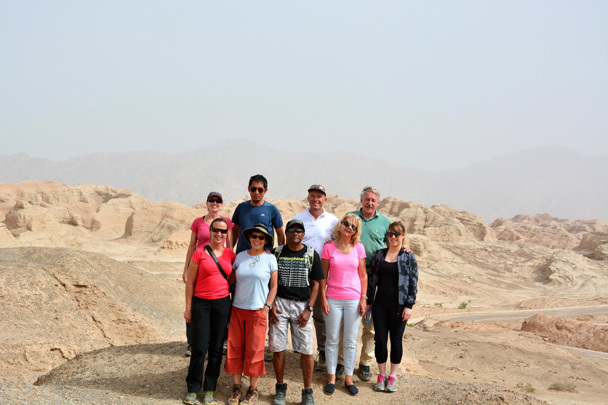 While our jeep team drivers were getting lunch ready we took a short walk to look at some nearby mountains. 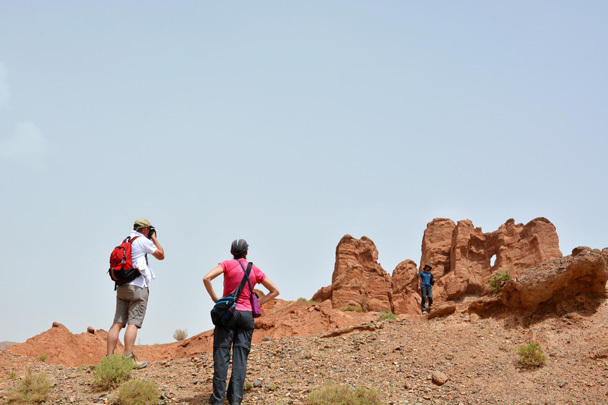 The mountains looked plain from a distance, but when we got closer we found amazing and different colours and shapes. We came back to find that our drivers had prepared a true feast for us. Such good food prepared in the middle of nowhere. 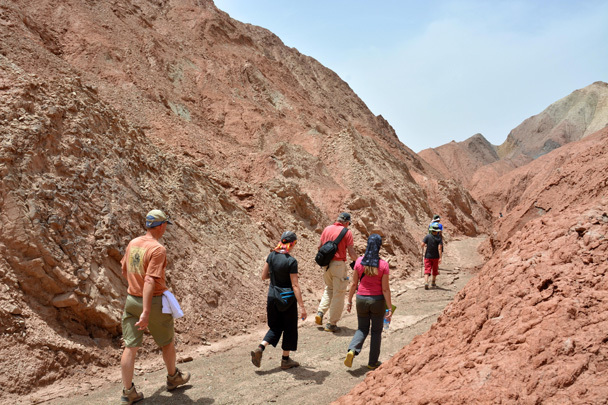 After lunch we set off again, with Kashgar our destination. 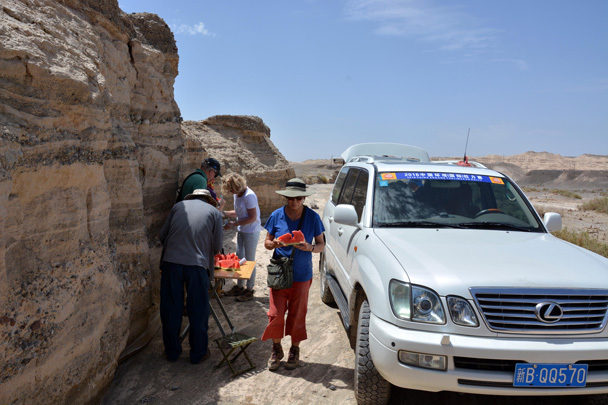 Exploring some mountains on the way to Kashgar while our drivers are preparing lunch for us. 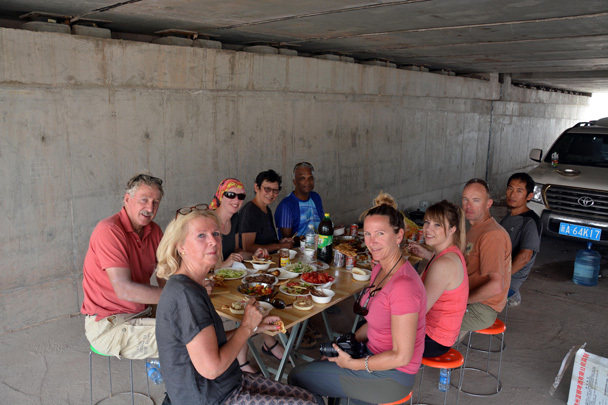 Having our fancy lunch in the “fancy restaurant” – a shady spot under the highway on the way to Kashgar. 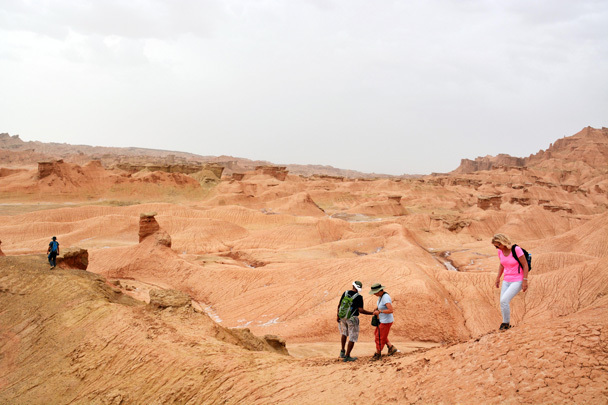 We woke up in Kashgar, and set out on a day of exploration. 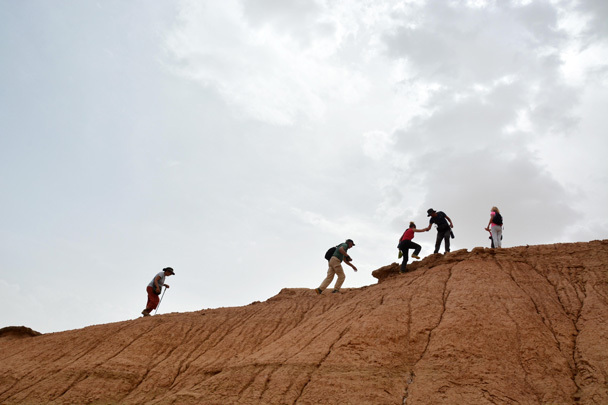 In the morning we went to the Tomb of Xiangfei, near Kashgar City. Xiangfei was a concubine of Emperor Qianlong, a Qing Dynasty Emperor. 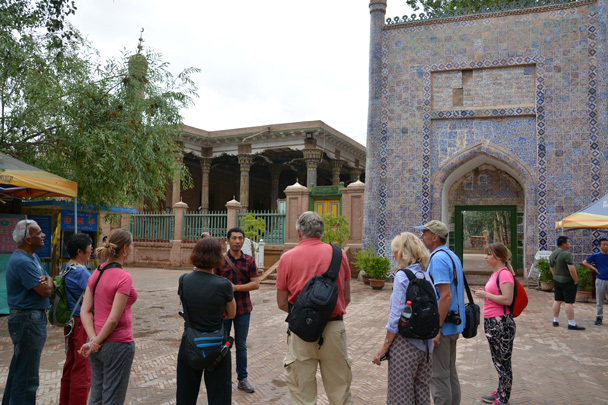 After our visit to the tomb we went to the Grand Bazaar in the center of Kashgar City. 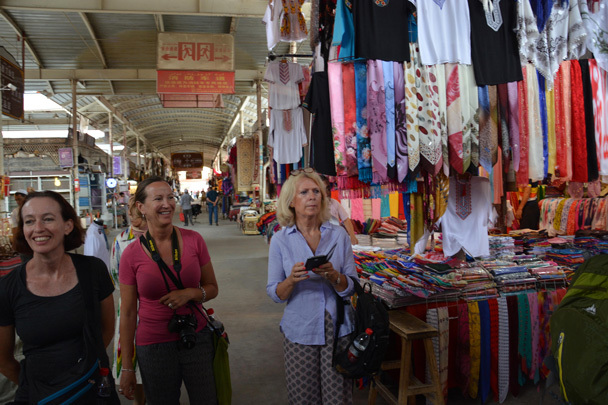 The official name of the bazaar is the Central Asia Grand Bazaar, and it is truly huge. 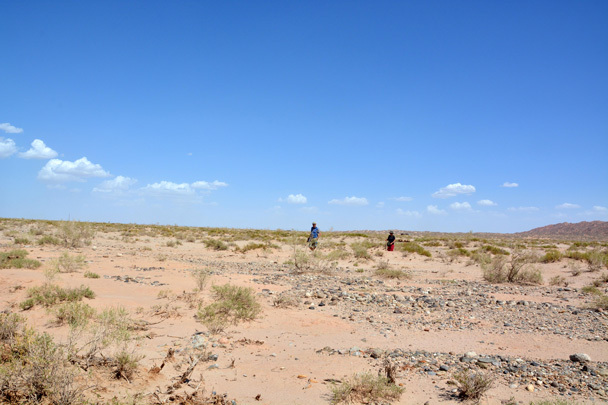 We browsed for an hour and decided we might need to come back later to explore more. 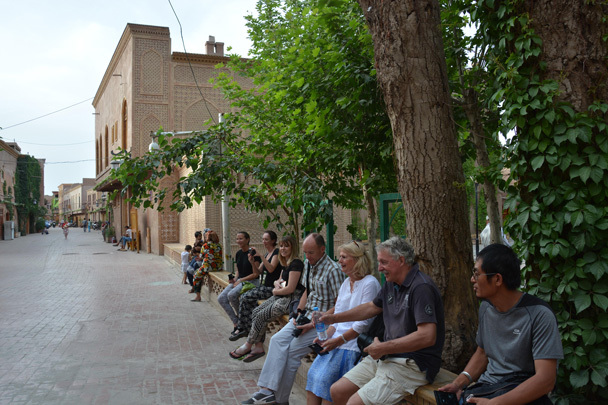 Our next stop was the Old City of Kashgar, where we walked about the narrow lanes to see the traditional Uyghur-style architecture and all types of different shops and stores. Next up was lunch, and we visited a fancy restaurant. 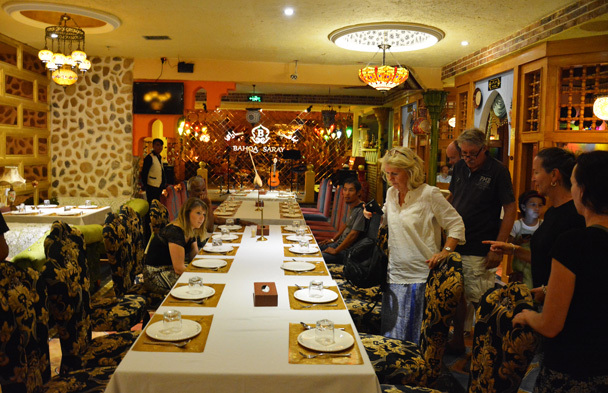 The food was great, and as we ate we were fortunate to enjoy the live performance of local folk music. 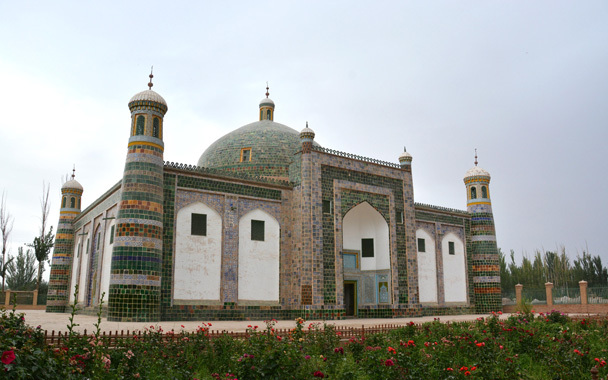 After lunch we visited Id-Kah Mosque, the largest in Xinjiang. 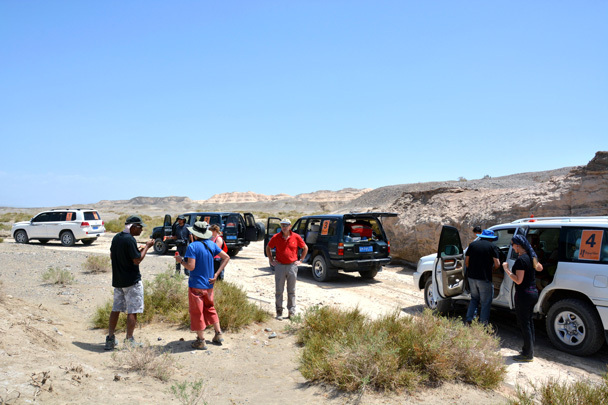 In the afternoon we were left with free time, and split up to explore on our own. 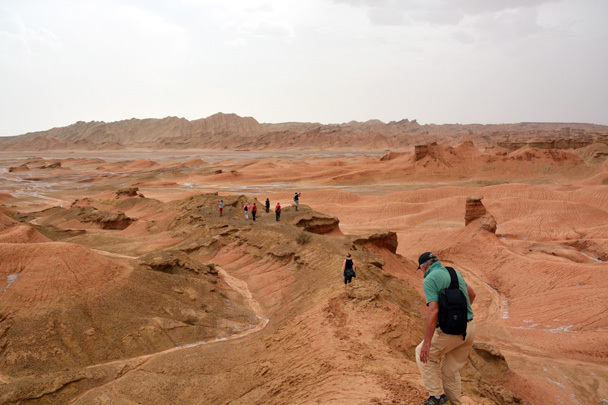 Our local expert in Kashgar is giving information about the Tomb of Xiangfei. 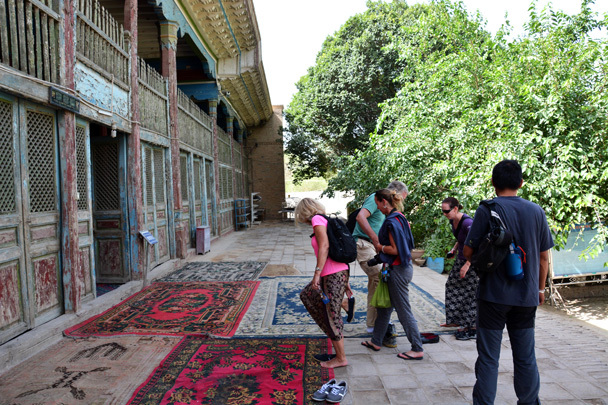 The cloth and material section of the Central Asia Grand Bazaar in Kashgar. 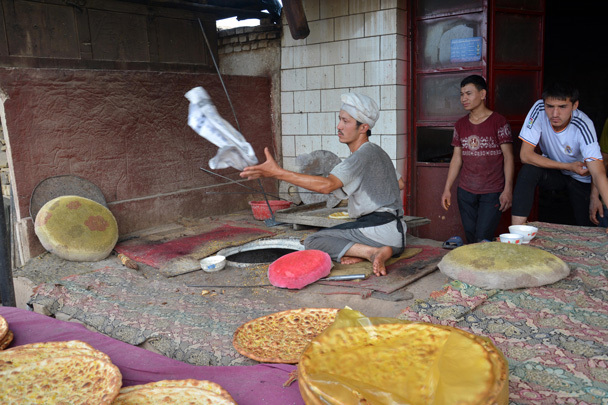 A restaurant in Kashgar with nice decoration and authentic Uyghur food. First time in a while we’d been to a restaurant that offered knives and forks! 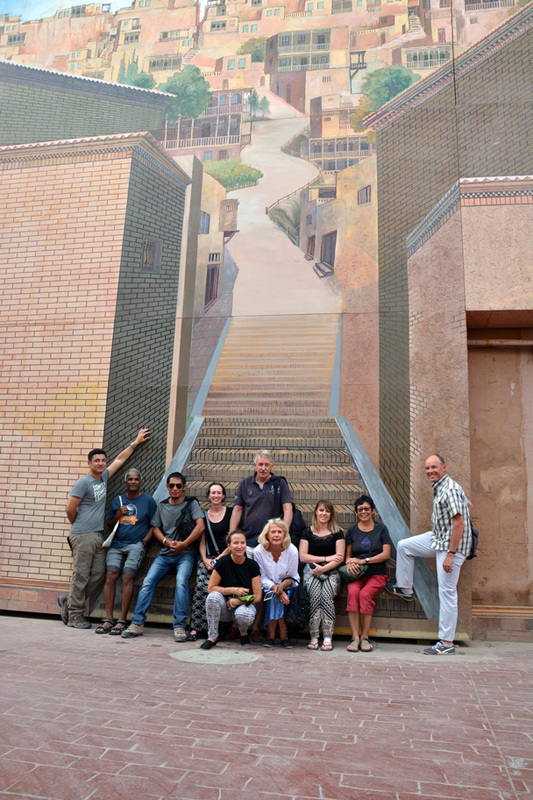 3D mural of the old city. 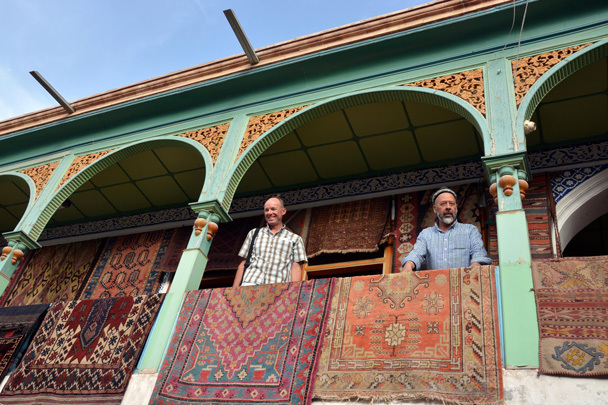 Carpet shop located in the old city in Kashgar. 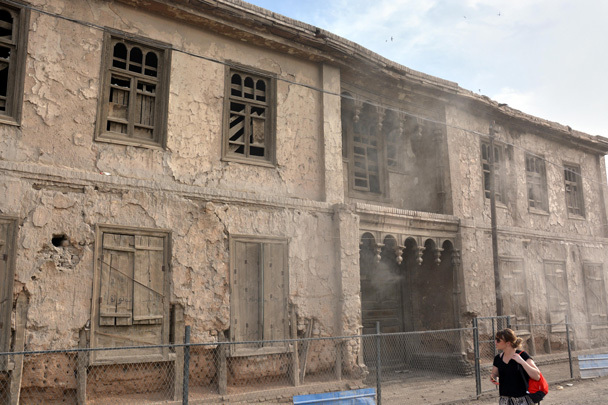 The building is was used during the filming of the movie Kite Runner. 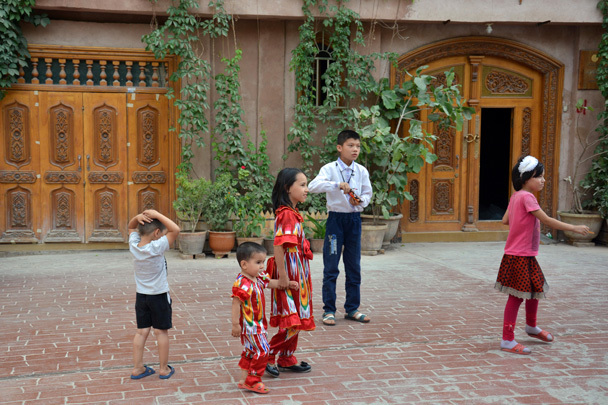 Kids are playing in front of their houses in the old city area of Kashgar. We stopped for a rest in the old city. Great spot for people-watching. 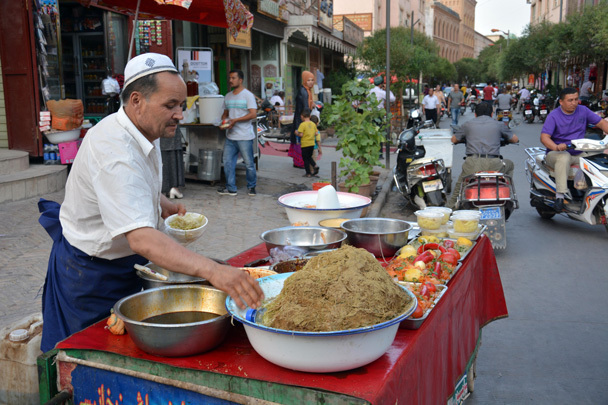 ‘Bean Jelly’ for sale in the old city. 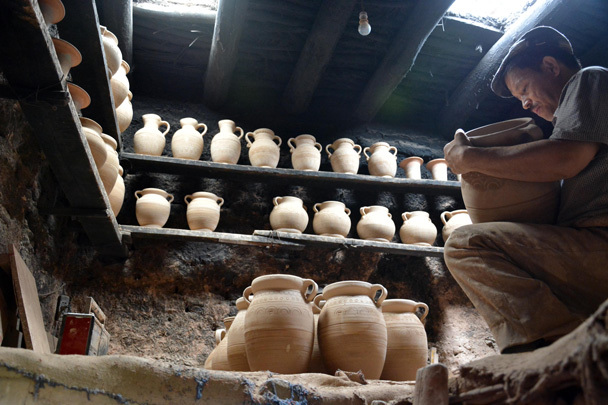 Working in traditional way in his pottery workshop. 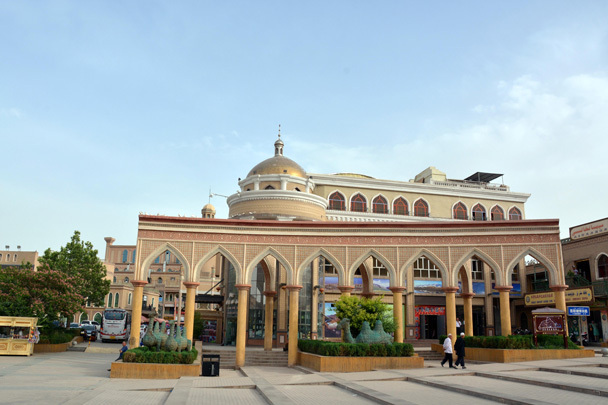 Architecture in Islamic style located in the Id-Kah square in Kashgar. 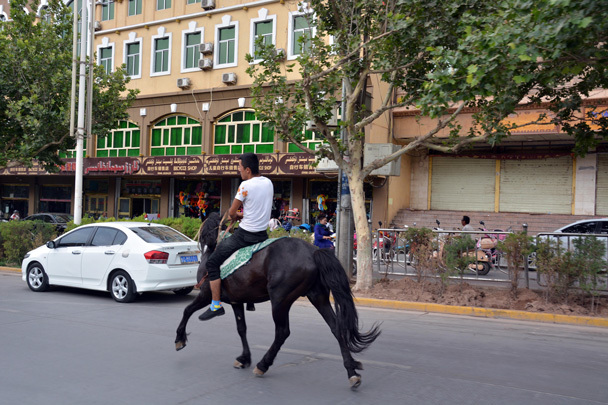 Young local guy with his horse in the city. 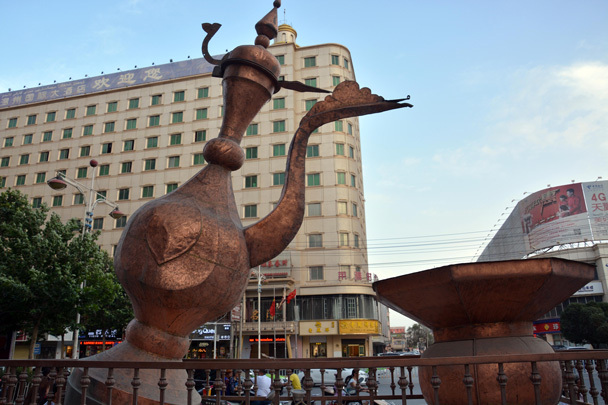 A sculpture of a traditional kettle in Kashgar. 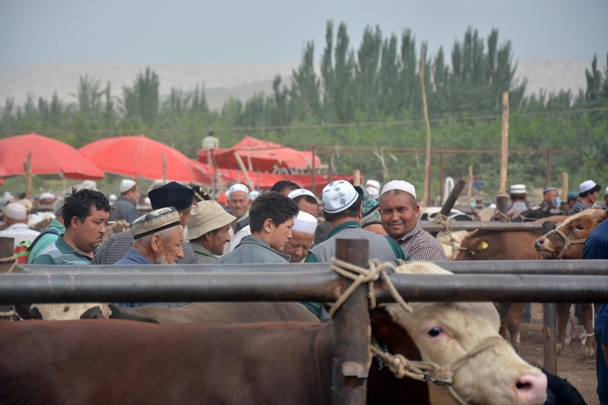 On the last day of our trip, we visited the livestock market just outside Kashgar city. 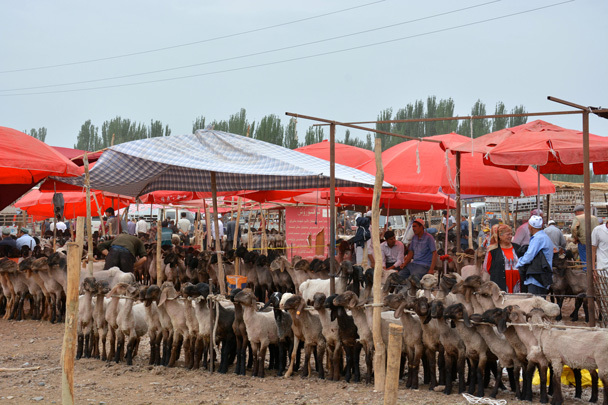 The market was filled with sheep, cows, donkeys, and people who were selling or buying livestock. After we spent an hour at the market we went to a local house to have our lunch. The house was decorated in the traditional local way and the food was delicious, served under the shade of grape vines in a covered courtyard. 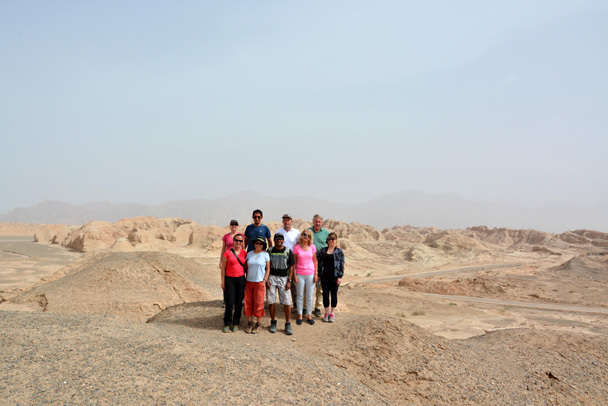 Then it was farewell to our drivers and local guide, and off to the airport to fly back to Beijing. Negotiating the price of sheep at the livestock market. 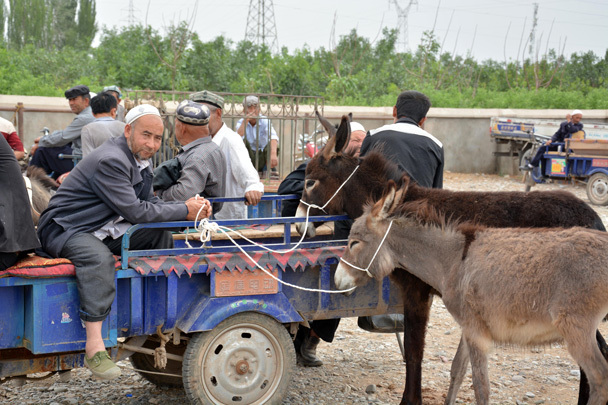 Man is waiting for a buyer for his donkeys. 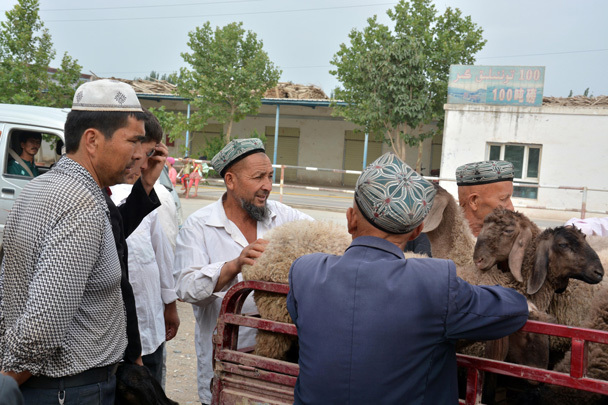 Sheep for sale at the livestock market nearby Kashgar city. 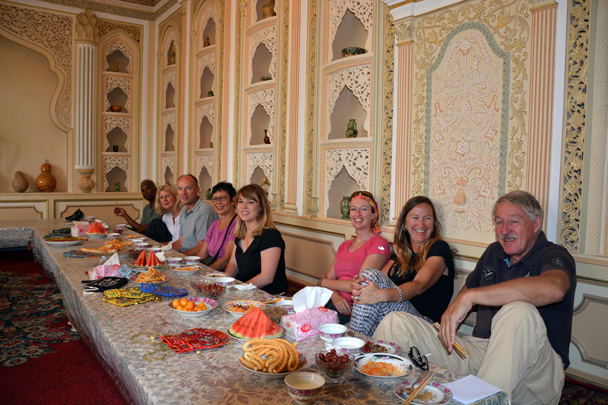 Lunch at the local people’s home outside of Kashgar City. 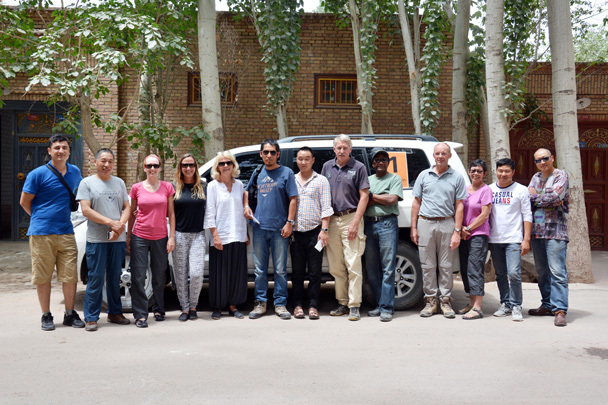 Group photo with our drivers at a family home in Kashgar. 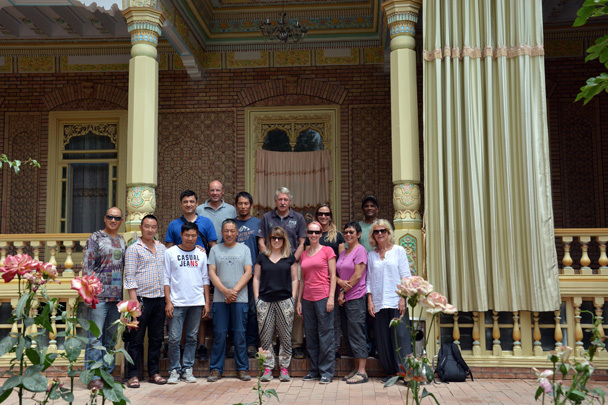 Group photo of the whole team before we leave Kashgar. Thanks for the write up, Abu!